Virtual Ability: Humpday Hint: Test Your GFCIs Now! GFCI stands for Ground Fault Circuit Interrupter. GFCIs are one of the top electrical safety devices in homes and workplaces. A GFCI trips the circuit breaker, turning off the flow of electricity, if it detects ground faults or leakage currents. If a person becomes part of the path of a leakage current of electricity, they could be severely shocked, burned, or electrocuted. 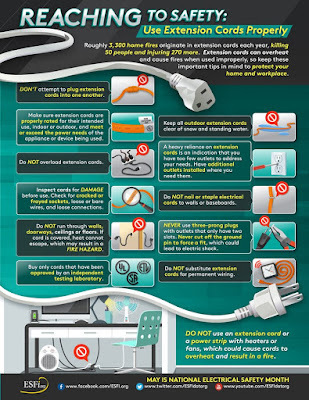 Unfortunately, over a quarter of US consumers don’t know that GFCIs can help prevent electrocution. Even more disturbing, among those who understand the importance of GFCIs, almost none test them every month and after every electrical storm. It is possible that as many as 10% of GFCIs now installed have been damaged in the past by lightning or electric surges, and are no longer functioning properly. Here’s how to test the GFCIs in your home. Push the "Reset" button of the GFCI receptacle to begin the test. Plug a small lamp into the GFCI and turn it on. The light bulb should now be ON. Push the "Test" button of the GFCI. The light should go OFF. Push the "Reset" button again. The light should again turn ON. If the light does not turn off when the “Test” button is pressed, then the GFCI is not working or has been installed incorrectly. If the "Reset" button pops out during the test but the light does not go out, the GFCI may have been improperly installed. In either case, the GFCI may not offer shock protection. 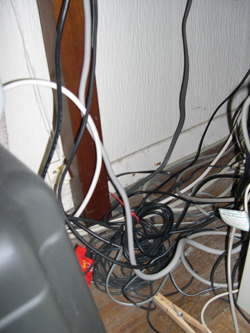 Contact a qualified electrician to check the GFCI and correct the problem.